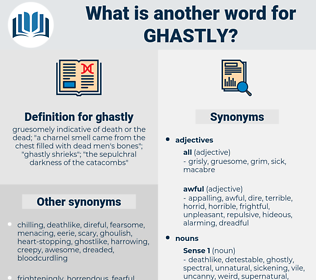 What is another word for ghastly? gruesomely indicative of death or the dead; " a charnel smell came from the chest filled with dead men's bones"; " ghastly shrieks"; " the sepulchral darkness of the catacombs"
horrible, terrible, horrifying, appalling, horrendous, horrific, hideous, gruesome. frightening, despicable, vile, frightful, horrid, abhorrent, abysmal, nasty, egregious, miserable, creepy, wretched, scary, grim, deadly, disgusting, unspeakable, abominable, dire, beastly, dorky, wicked, impermissible, harrowing, fearsome, formidable, dog-ugly, terrific, dismal, ominous. dreadful, awful, heinous, atrocious, terrifying, dastardly, ugly, shocking, god-awful. good, comforting, nice, great, delightful, pleasing, beautiful, pretty, wonderful, pleasant. decreased, feeble, shallow, inviting, superficial, consoling, appealing, eased, alleviated, subdued, lessened, light, diminished, moderated, reduced, tranquilizing, enticing, unalarming, soft, qualified, lulling, toned, weak, inoffensive, reassuring, relaxing, cheering, soothing, pacifying, calming, moderate. Arthur only shook his head with a ghastly smile. Why, that one smile on that ghastly face would be thought worth his fifty dollars by the children's friend, could he see it.